Twenty-six famous ao dai (Vietnamese traditional long dress) designers will participate in the sixth annual Áo Dài Festival in HCM City to be held from March 2-17. H’Hen Nie, Miss Universe Vietnam, and Catriona Gray, Miss Universe 2018, were among the special invitees who attended a fashion show by Vietnamese designer Phuong My as part of New York Fashion Week. Vietnamese beauty H’Hen Nie has been listed among the Top 8 of the Miss Grand Slam 2018 beauty competition as announced by Globalbeauties. H’Hen Nie has become the first Vietnamese representative ever to win the Timeless Beauty award, as announced by Missosology on January 28. Winner of Man of the World 2018 Cao Xuan Tai has been chosen as ambassador for season three of Viet Nam Fitness Model 2019. Vietnamese beauties Tieu Vy and H’Hen Nie have been named among the Top 50 of Miss Grand Slam as announced by Global Beauties. VietNamNet Bridge – Who doesn’t love a nice bánh mì? It’s often the first choice for lunch, and even the late celebrity chef Anthony Bourdain once described the Vietnamese bread as ‘a symphony in a sandwich’. 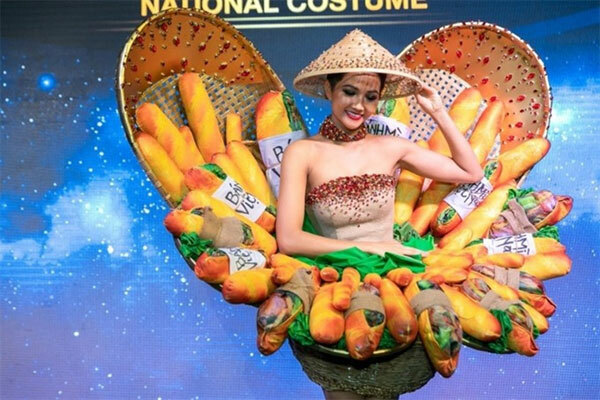 Let’s take a look back at a few Vietnamese traditional costumes that have impressed foreign judges and audiences at international beauty pageants through the years. The Miss University Vietnam 2018 contest was launched in Hanoi on August 29 for students aged 18-24 nationwide.